For all you glampers out there looking for the added luxury of a hot tub, we’ve got it covered. Here at Cool Places we have a range of great sites, ranging from remote spots and woodland hideaways, to sensational coastal settings. For all your hot tub glamping needs, check out our favourites, there’s sure to be something that tickles your fancy. Who's up for a beautiful Somerset farm with an unpretentious, back-country atmosphere ? It's a peaceful rural escape that’s ideal for group stays, couple breaks and family holidays, with either safari tents or a cool wooden cabin they call The Deckhouse – plus your own personal wood-fired hot tub! This romantic spot in the Scottish Borders has seven sumptuous roulottes (traditional French wooden caravans), full of character, each one uniquely decorated. Offering yoga, massages and beauty treatments, this is truly a place to de-stress. And the hot-tub action? Stay in Gitana and Zenaya and sink into your secret eco hot tub, where you can gaze up at the stars and enjoy the moment. If you’re after a lovely spot, look no further than Graywood, a luxury camping retreat in Sussex. Their top-notch, spacious yurts are the ultimate in glamping - stylish and unique. Made in Seattle, they boast a range of mod cons and are often used as full-time residencies over there. What’s more, there’s a hot tub to enjoy - make the most of the dazzling night skies and take a soak. Set in Welsh woodland, Cosy Under Canvas is all about the extra touches, like the homemade cakes on arrival. For couples and families alike, this off-grid, eco-friendly site manages to be luxurious, rustic and cosy, all at once. Spend time on site in the Cosy Corner and Cosy Lounge, or go further afield and hike the surrounding area. The icing on the cake? 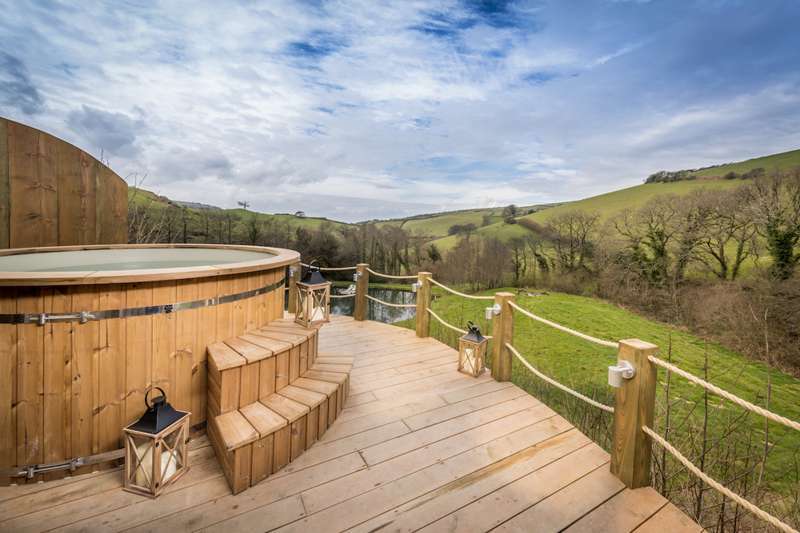 Each of the seven geodesic domes has a wood-fired hot tub, perfect for a relaxing dip at any time of the day. A quirky retreat in Scotland's Cairngorms National Park, this compact site is a place to get away from it all. Stay in their Woodman's Hut and you'll be totally off-grid. If that's not for you, opt for the Lambing Bothy or Duck's Nest, their other glamping options. A wood-fired hot tub completes the picture. At the edge of the garden grounds, you can unwind in this secluded spot, with the Cairngorms providing an impressive backdrop. Scenic camping at its best! What could be better than a countryside camping spot overlooking the North Devon coast, with its own private lake? At Longlands, five boutique glamping lodges nestle in a secret valley, each sleeping six, each homely yet luxurious. Lounge on your deck with a glass of wine, and look out to the rolling fields. Or make a date with the hot tub, well-placed on its own deck above the lake, a perfect way to take in the views. Kátur means 'happy' in Icelandic, and this glamping spot will definitely make you feel that. An off-grid, eco-friendly site in North Yorkshire, there are a number of camping options (Hobbit pods, Unidomes, Bell tents, Tipis, Safari tents, Geodomes....) for you to choose from. Not to mention a range of adventurous outdoor activities, such as segways and zipwires, plus a number of indoor options like cocktail-making and yoga classes. To top it all, this luxury camp has an outdoor wood-fired hot tub, where you can relax, take in the scenery, and feel even happier. Escape the city and head to heart of rural Lincolnshire, where you'll find Crowtree Wigwams, a farm-based glamping site. True, these are not technically wigwams, but heated and cosy wooden cabins, in a tranquil, rural location, each with a verandah where you can gaze out to the open countryside. The added bonus? Wood-fired hot tubs no less, another spot you can admire the views from. If the Cheshire countryside is calling you, what better place to see it from than The Rookery Shepherd's Hut. Nestled in the corner of the owner's garden, the bespoke hut was built from scratch. Spacious but cosy, it's ideal for a romantic getaway. Did we mention the hot tub just outside the door? After a day exploring the area, it will tempt you in. Don't forget to take a glass of bubbly with you. Just like in the children's book – this tiny cabin hideaway in Kent comes with its own private and very secluded garden, into which you dash (robe and slippers provided) to the two-person wooden hot tub and sit gazing up at the stars while enjoying a glass of bubbly. Afterwards, light the outdoor firepit and toast marshmallows to your heart's content.